Barbara Bush and Hillary Clinton share the title of the most admired first lady of the past 25 years, with current first lady Michelle Obama in a close third, according to the most recent NBC News/Wall Street Journal poll. With Mother's Day approaching, 27 percent of respondents picked Barbara Bush as the most admired first lady, an equal percentage chose Hillary Clinton, and 24 percent selected Michelle Obama. Former first lady Laura Bush was fourth at 17 percent. But there are striking splits among different subgroups. Democrats narrowly prefer Michelle Obama over Hillary Clinton, 42 percent to 39 percent. 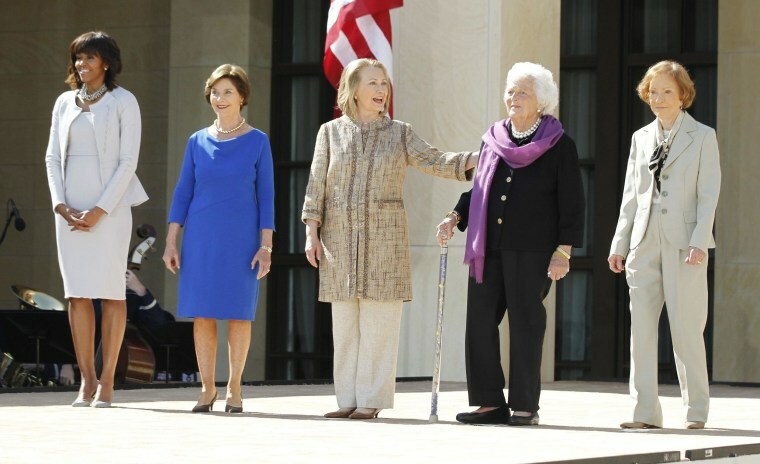 Republicans prefer Barbara Bush over Laura Bush, 45 percent to 36 percent. And independents admire Barbara Bush (28 percent) and Clinton (27 percent) the most. Among African-Americans, it’s Michelle Obama at 58 percent and Hillary Clinton at 30 percent. Among Latinos, it’s Clinton at 45 percent and Obama at 29 percent. And among whites, it’s Barbara Bush (33 percent), Clinton (24 percent), Laura Bush (21 percent), and Obama (18 percent). The NBC/WSJ poll was conducted April 23-27 among 1,000 adults (including 300 cell phone-only respondents), and it has an overall margin of error of plus-minus 3.1 percentage points.